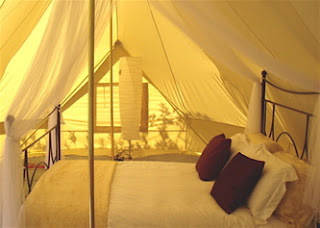 Glamping it up in Sardinia ~ Sardinia Baby! This British couple may well be onto something here. 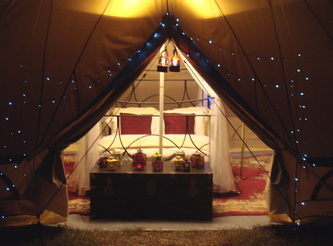 'Glamping' is becoming more and more popular with people looking for alternative camping holidays with a bit of added luxury. "We are an English couple who moved to this beautiful part of the world four years ago. We were looking for our perfect retreat away from the hustle & bustle of everyday life. The village of Martis offered all this and more. You have 6 acres of untamed countryside to wander and relax in. We have a fully stocked orchard and are proud to sport almond, walnut and many fig trees. We have two 6m Emperor tents on site, each has private shower & toilet cabin separate from the tent equipped with an Italian designed wash basin, heated gas shower and a simple effective eco friendly compost toilet. Our compost is a mixture of wood chip, hay, sawdust & fennel. 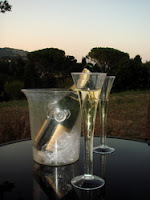 There are many places for you to sit and eat, drink or just relax in the 6 acres at Bella Pineta. You are in a totally rural enviroment and you are always welcome guests of the wildlife. The summer can be hot and dry so we provide a little CoolPool paddling pool for chilling out. The pool is gently chlorinated and is refreshed from our well. The pool is emptied and refilled for each guest. Lighting is mainly solar & wind up lanterns powered with additional help from the moon & stars, it looks so pretty at night. Some battery lights are provided. Your tent has effective zipped doors and mosquito proof mesh windows and we provide the added luxury of a mosquito net over the beds. We can supply a delicious continental breakfast with a selection of breads, pastries, yogurt, cold meats and cheese. The homemade preserves are a feature at Bella Pineta. Continental breakfast can be delivered to your tent on a tray and is an additional 5 euros per person. Each tent has an al fresco kitchen. 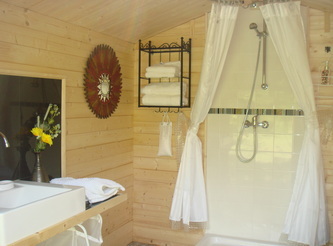 There is an area at the back of the main house with a large gazebo covering a fridge, electric points, mirror, hairdryer and storage for your kitchen use. Outside of the gazebo there is your personal little gas cooker, kettles, pots, pans, plates tables, chairs, bbq and social area. The other tent shares only the area not your kitchen facilities. All of your washing up is left for us to do so no worries there! We supply hot water in airpot flasks down at the tents for early morning tea, coffee if you wish and a cool box for the champagne!! You can cook and dine up at the house or take it all to your tent. Everything is located outside and for your exclusive use so you can sit out and brew up all night and day if you wish! "